This Certified Mercedes-Benz A200 Petrol, finished in Polar Silver with combination DINAMICA / ARTICO upholstery, is the perfect all-rounder. Featured packages include Vision Pack with panoramic electric sunroof and LED headlamps; COMAND Pack with Harman Kardon surround sound system and LINGUATRONIC voice control operation; and AMG Line with lowered sports suspension, carbon-fibre look trim, privacy glass, two-pipe exhaust system, 18" AMG alloys and AMG body styling. Standard features such as Navigation, Keyless Start, Bluetooth with media streaming, Dynamic Select, and rear view camera with front and rear sensors will ensure your driving experience is comfortable and refined. 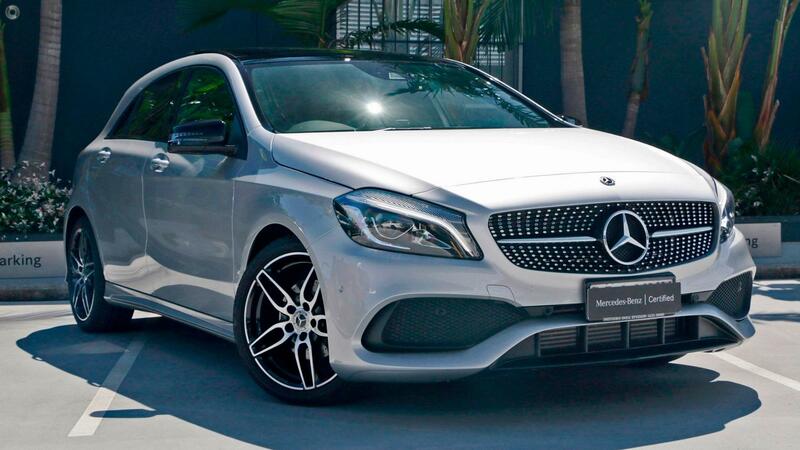 This vehicle also features blind spot assist along with active parking assist, ensuring this A-Class is both purposeful and stylish. To ensure you are covered by a comprehensive after sales experience we offer the balance of your new vehicle warranty. We are Queenslands largest authorised Mercedes-Benz Pre-Owned Dealership located just 5 minutes from .